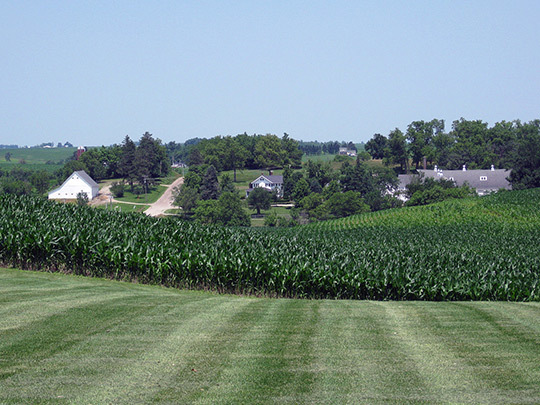 Photo: Maytag Dairy Farms, Newton, IA. Farm was started in 1919 to supply milk to the Maytag family and the Maytag Company. Brothers Frederick and Robert Maytag created a cheese plant and storage caves in the 1940s. Photographed by User:Christiane Tas (own work), 2010, [cc0-by-1.0 (creativecommons.org/publicdomain/zero/1.0/deed.en], via Wikimedia Commons, accessed July, 2104. The Jasper County Courthouse is located at 101 First Street North, Newton, IA 50208; phone: 641-792-7016. Organized in 1846, Jasper County is named for Revolutionary War hero, William Jasper [1750-1779], a sergeant in the South Carolina 2nd Regiment.